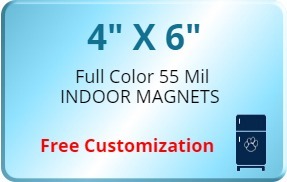 4x6 Personalized Rectangle Shape Indoor Magnets 55 Mil Round Corners are a nice way to convert potential customers to regular customers. These custom magnets are presented with free design and full color processing facilities to let you showcase brand details impressively. The high durability and strength makes these Custom Square and Rectangle Magnets perfect option for promotions that last long. They are Made In USA and are offering free shipping in the Contiguous USA. Supermarkets, hospitals and emergency services can make the most of these magnets for making people remember their services and products when in need. Request a quote to know price cuts that you can avail for wholesale 4x6 Personalized Rectangle Shape Indoor Magnets 55 Mil Round Corners.